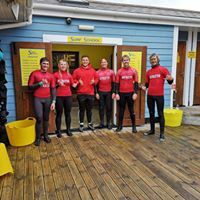 Zach - back for his second season at North Devon Surf School, he can't stay away! John - practically born and bred at North Devon Surf School! He's never allowed to leave! Sam - he qualified with us last year and is now back as a full-time instructor! Stuart - new to the team, he qualified in Morocco but is quickly realising that Westward Ho! is the place to be! Steve - a North Devon Surf School veteran with a wealth of surfing knowledge! Shaun - he's just become a Dad, but that won't keep him away for long! Will - combining surf instructing with A Levels, we're hanging on to him before he goes off to become a doctor!